Joel Feder January 23, 2019 Comment Now! 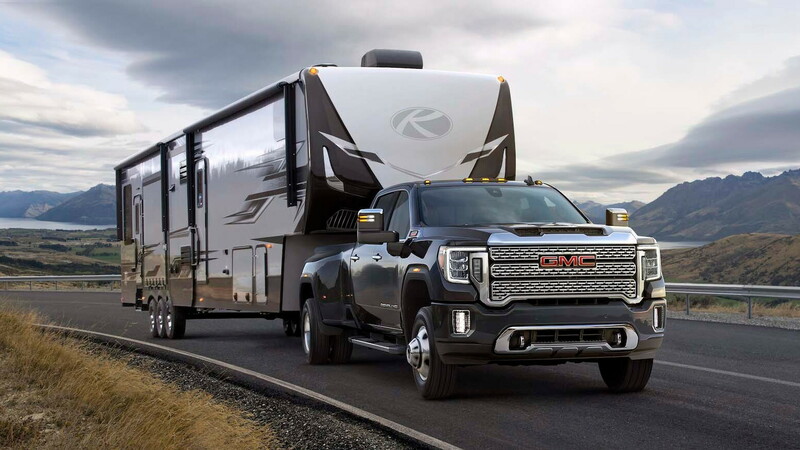 Trucks are designed to work and the 2020 GMC Sierra Heavy Duty lineup has a laser focus on towing. 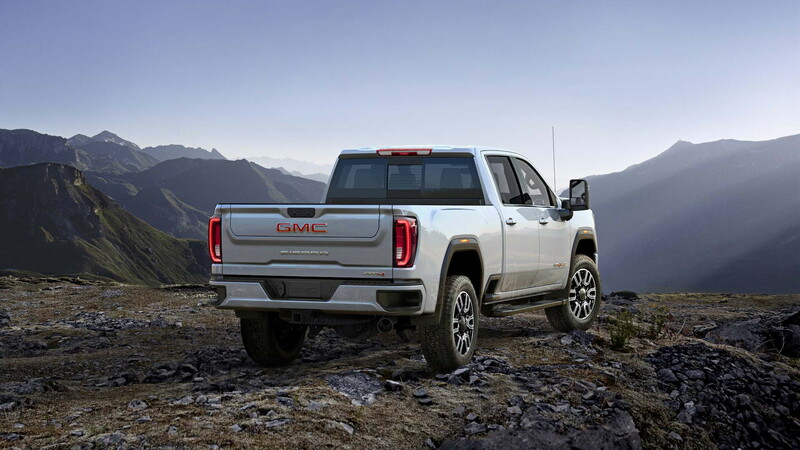 Unveiled Tuesday, the 2020 GMC Sierra HD family of pickup trucks is larger with more chrome, more lights, and more tech than before. Hauling—whether it's a trailer, boat, or load of bricks—starts with power. 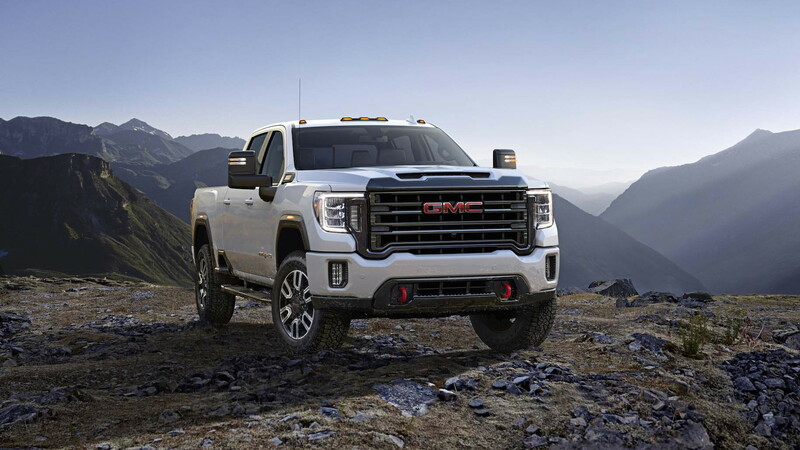 GMC didn't fully outline the new HD's powertrain lineup, but confirmed the Duramax 6.6-liter turbodiesel V-8 will return with 445 horsepower and 910 pound-feet of torque, which is now paired with an Allison 10-speed automatic transmission. Rear-wheel drive will be standard while four-wheel drive will be available. A gas-powered engine wasn't detailed, but likely will be offered. 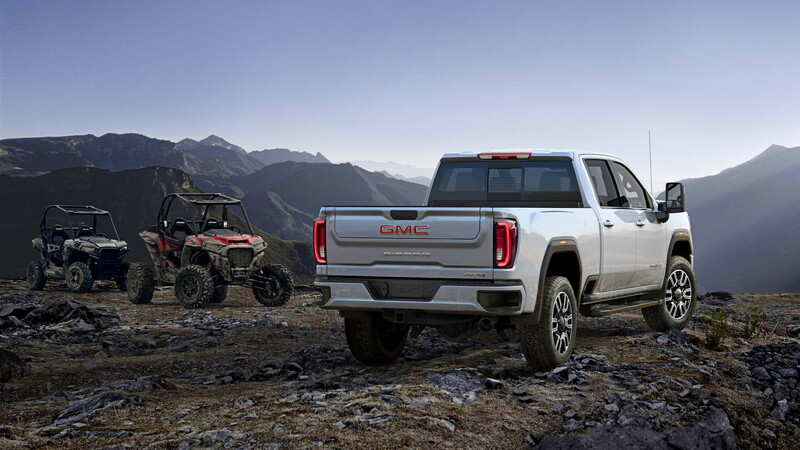 Full capabilities will be laid out closer to this summer, when the truck goes on sale, but GMC said the new HD lineup will be capable of tugging over 30,000 pounds when properly equipped. 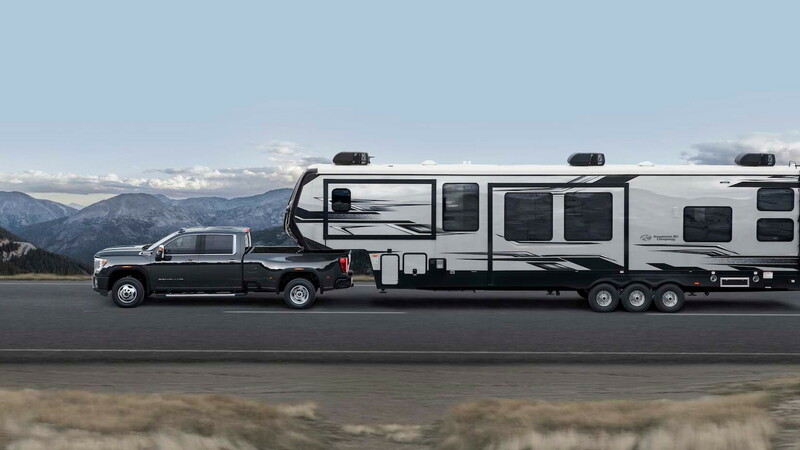 To be the HD towing king it'll need to beat the 2019 Ram Heavy Duty's max tow rating of 35,100 pounds. GMC didn't say how much the truck will cost when it goes on sale. Those hauling loads in the bed will find more space than before, though GMC hasn't yet detailed how much. A 120-volt power outlet will keep equipment running from the bed while 12 corner tie-downs will help keep the load secure. Loading that large bed should be easier than before thanks to a bed lift-in height that's lower by an inch compared to the 2019 Sierra Heavy Duty, cargo bed side steps on all models, and integrated rear bumper corner steps. The 2020 HD's massive exterior features a longer wheelbase, taller hood, functional hood scoop, and taller overall height, which renders the truck into a shiny brick with lots of chrome on most models. All exterior lighting is now LED including daytime running lights, headlamps, taillamps, available fog lamps, and roof markers. The light-duty Sierra's new six-function tailgate has been ported over to the 2020 heavy duty lineup, both in single- and dual-wheel configurations. To square off with Ram's Power Wagon, the 2020 GMC 2500HD and 3500HD will be available in AT4 trim with Rancho shocks, skid plates, Eaton locking rear differential along with 18-inch wheels wrapped in Michelin all-terrain tires, hill descent control, hill start assist, and off-road mode for the traction control system. The Sierra AT4 Heavy Duty will be available in single rear-wheel configuration only. Inside, the 2020 Heavy Duty's cab borrows the best from the 2019 light-duty truck with an 8.0-inch touchscreen infotainment with Apple CarPlay and Android Auto compatibility, leather, and real wood on Denali models. The GMC Sierra 1500's optional 15-inch color head-up display also has been ported over to the HD lineup. The full HD lineup hasn't been laid out, but expect multiple cab configurations along with bed lengths to be offered when the 2020 GMC Sierra Heavy Duty goes on sale this summer.